Preheat the oven to 400°F. 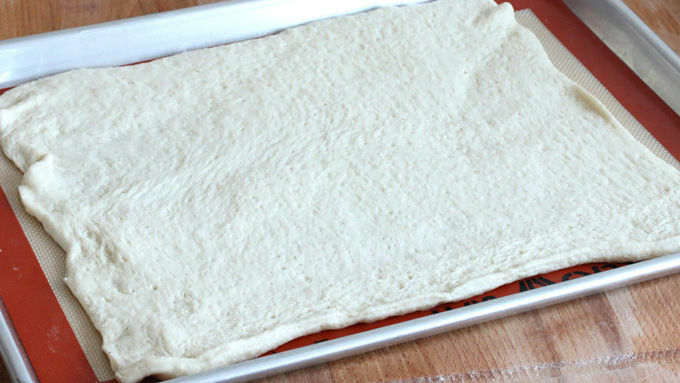 Unroll the pizza crust onto a non-stick or lined baking sheet and form into a rectangle or desired shape. Spread the ranch dressing over the crust, leaving about 1/4 inch space from the edges. 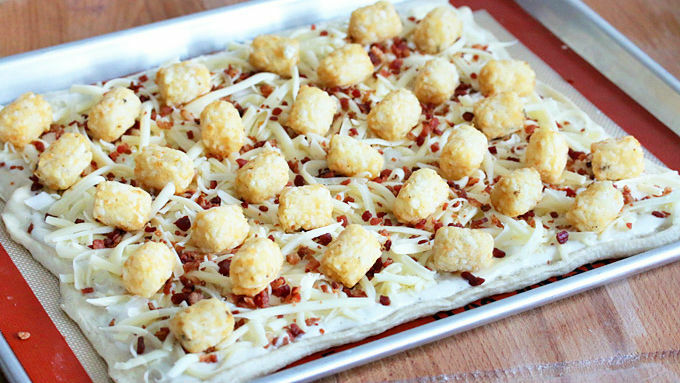 Sprinkle with onion, cheese and bacon bits and dot with tater tots. Bake for 16-18 minutes or until golden brown. Remove from the oven and immediately drizzle with nacho cheese sauce. Serve hot. The measurements are just a guideline. If you want your pizza "over"-loaded, feel free to add more! 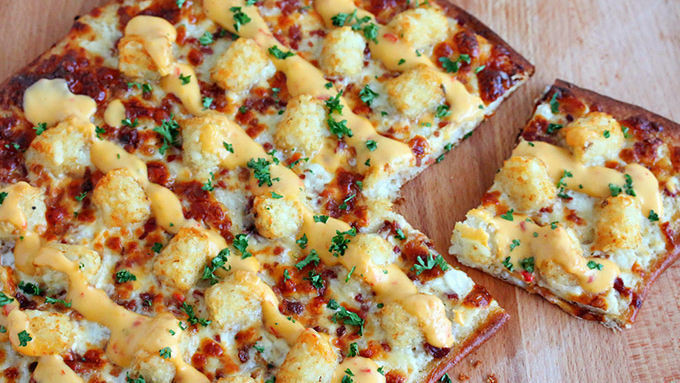 This over-the-top pizza comes fully loaded and ready to be devoured. Really, I don't know what else to say. It's pizza. It's loaded. With tater tots. And bacon. See, you're already running for the kitchen! And that's just what I did, too. And once I got to the kitchen it took all of 5 minutes to have this pizza loaded up and in the oven. And when this loaded pizza came out a few minutes later, it was bubbling and filling my kitchen with an aroma that I can only describe as "COMFORT." And then it was time to drizzle nacho cheese sauce over an already loaded comfort pizza. *GASP* By the way, the measurements are just a guideline. If you want your pizza even more "over"-loaded, feel free to add more! My husband and I devoured the whole thing. I'm not too lady-like to admit it. I pigged out. I gorged. And it felt goooood. Loaded. Tater. Tot. Pizza. Ready, set…EAT!